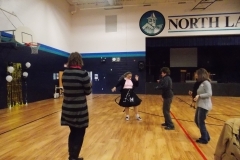 On Friday, December 2nd 2016, participants enjoyed a performance by the Kindergarten through grade 4 students of North Lake School. 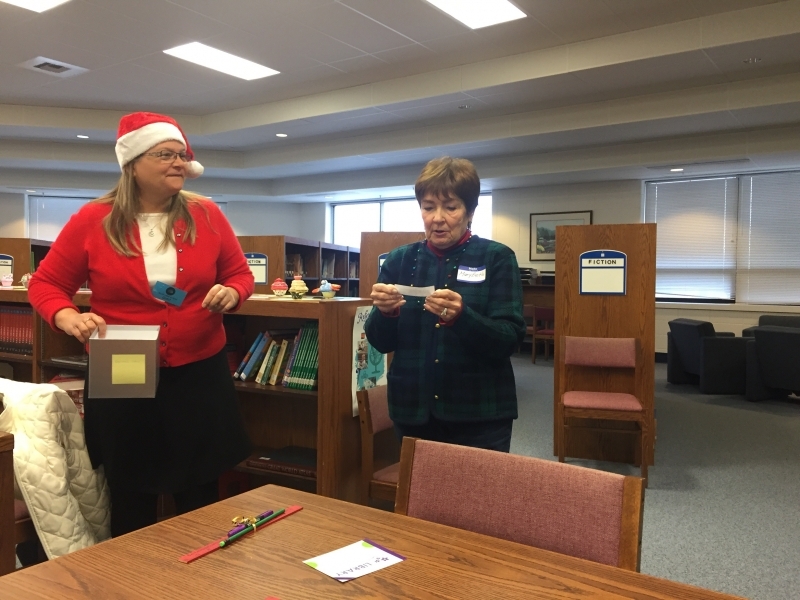 Helpers in red Santa hats were on hand to assist, and everyone met after the program to share holiday cookies and funny Christmas jokes! 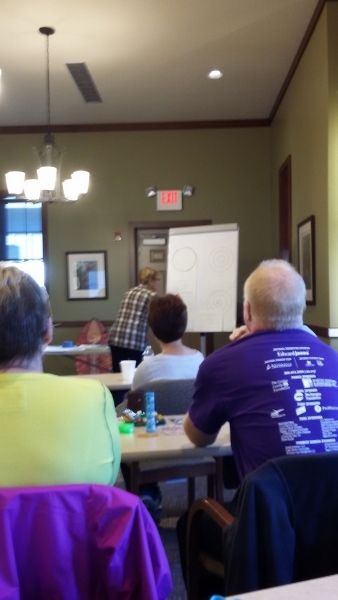 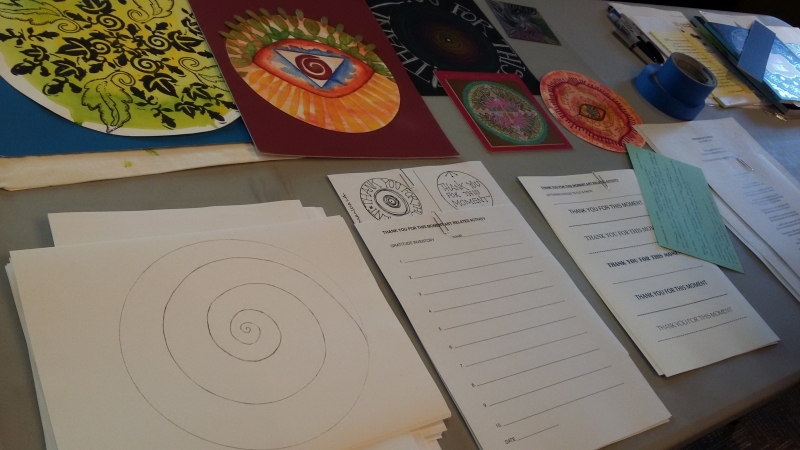 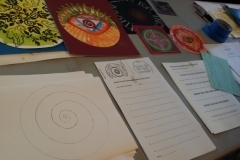 On Friday, November 4th 2016, artist Molly Groshek walked the Town Hall Library (North Lake) Memory Cafe’ participants through an art-related activity focused on “Gathering Gratitude.” She used mandalas as the framework for creating the art. 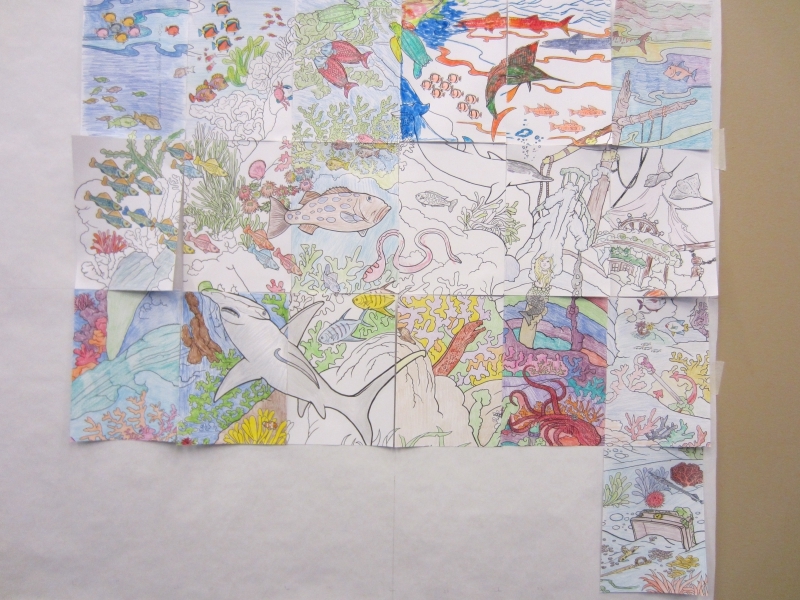 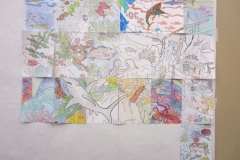 Everyone took the project seriously and wonderful works were created! 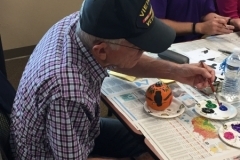 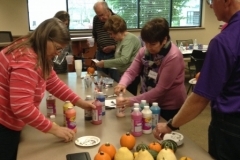 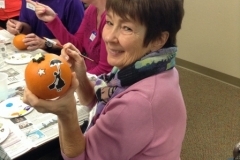 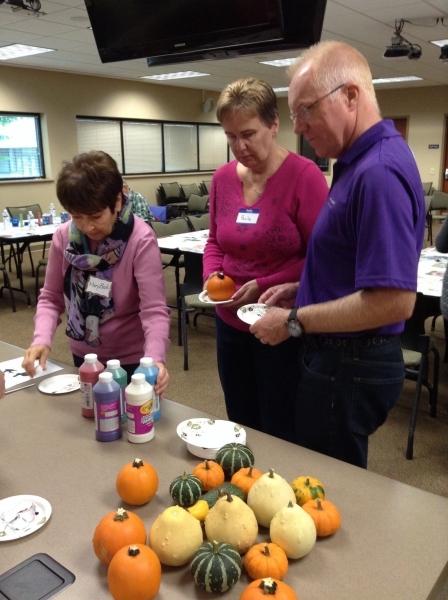 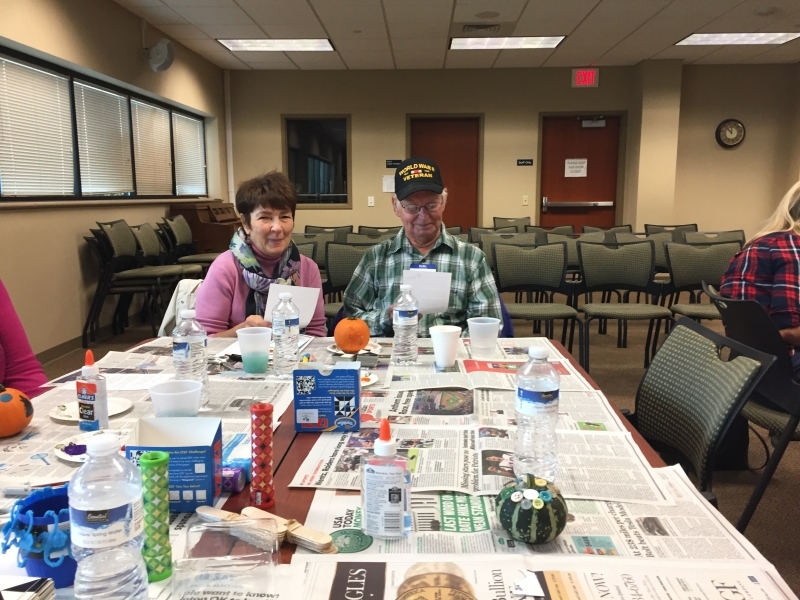 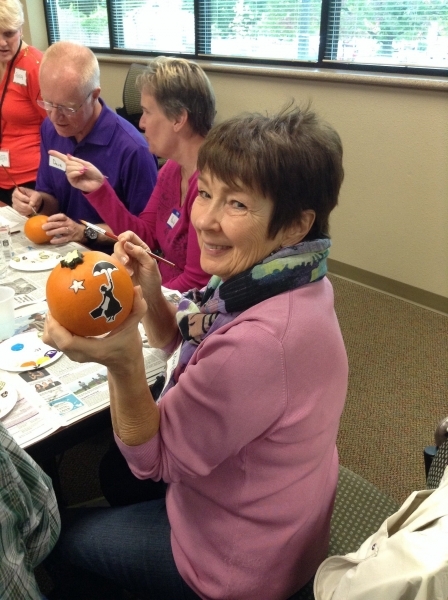 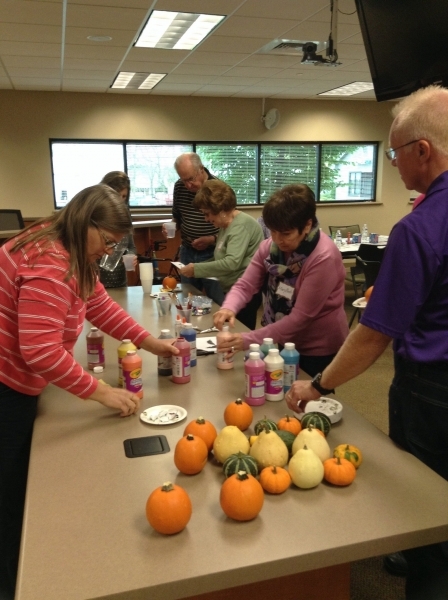 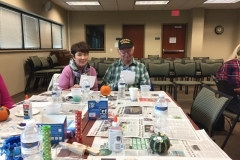 Fall was in the air as friends gathered to paint pumpkins and gourds at the Delafield Public Library on October 7th 2016. 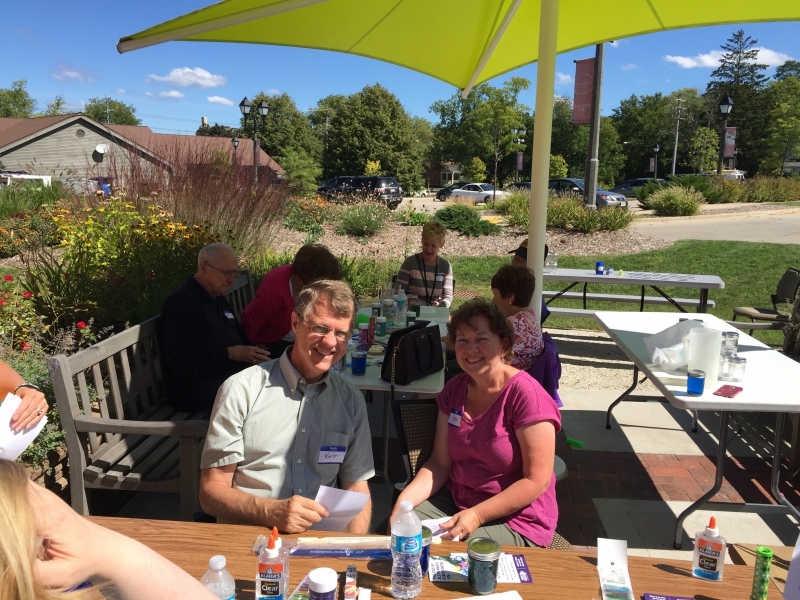 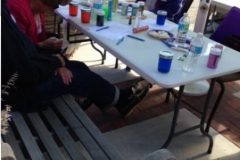 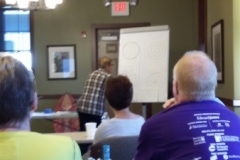 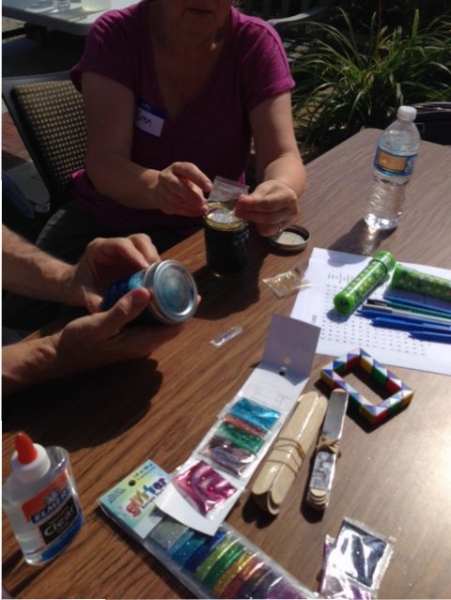 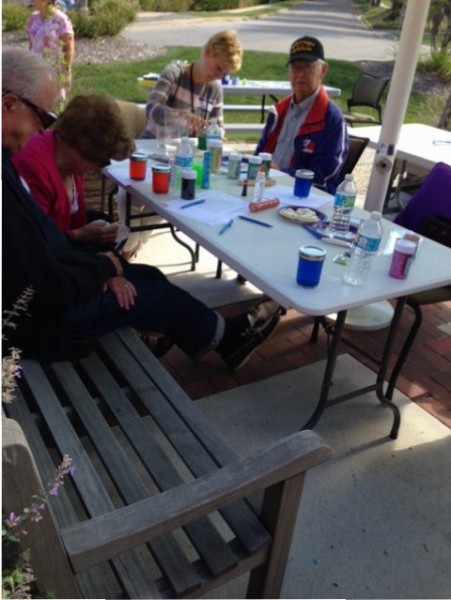 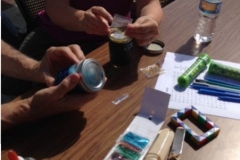 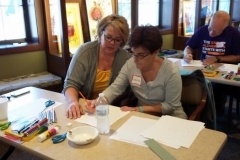 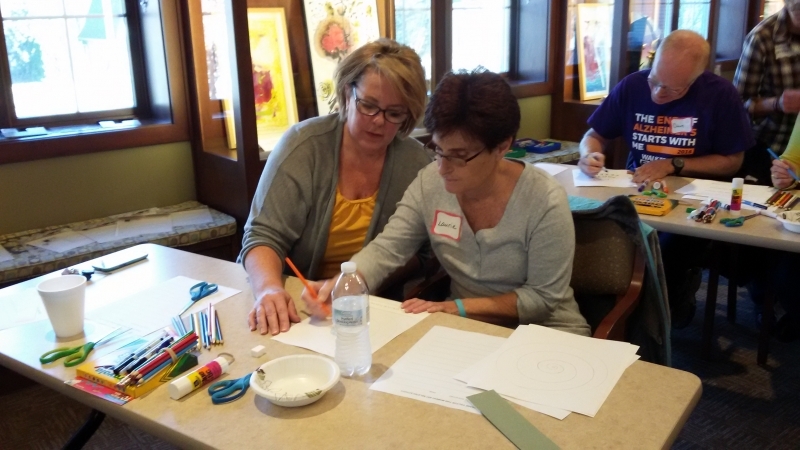 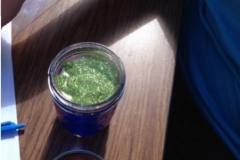 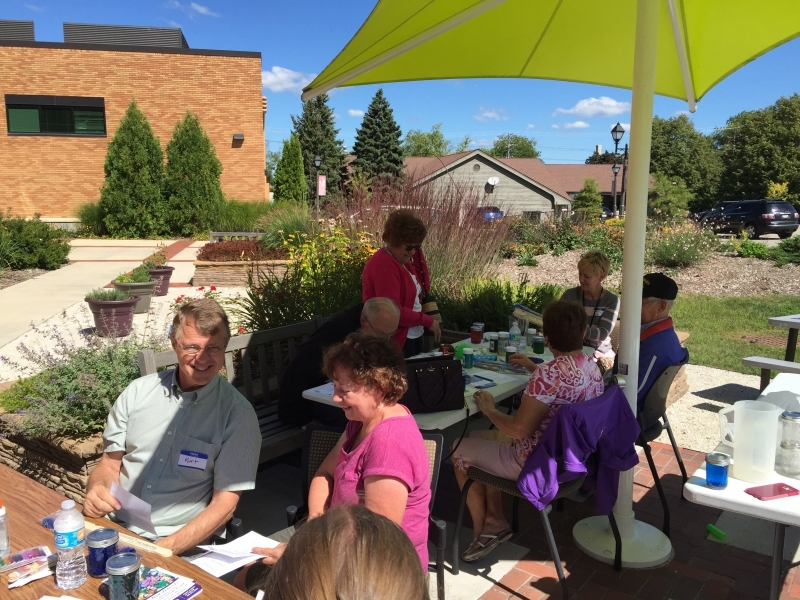 It was a beautiful day and beautiful setting to create mindfulness jars on September 2nd 2016 at the Delafield Public Library. 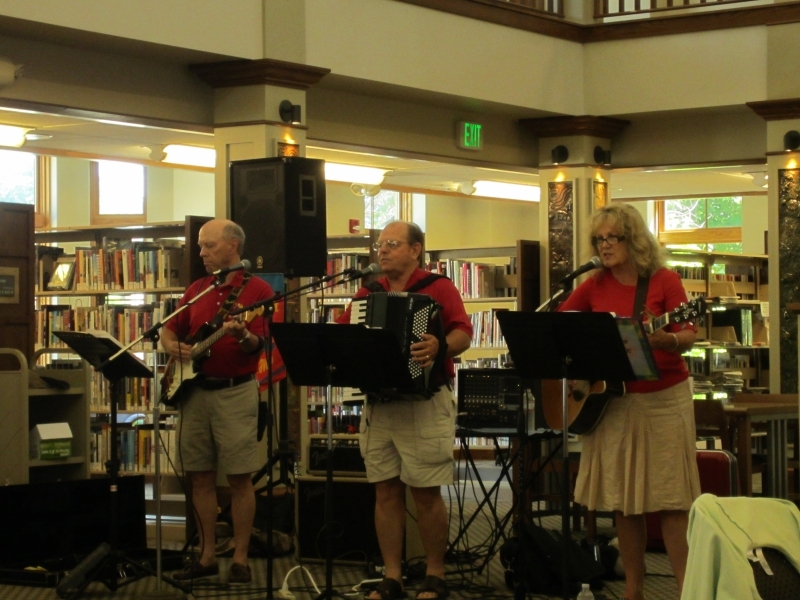 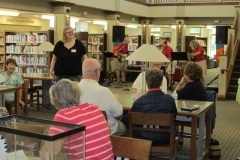 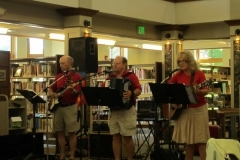 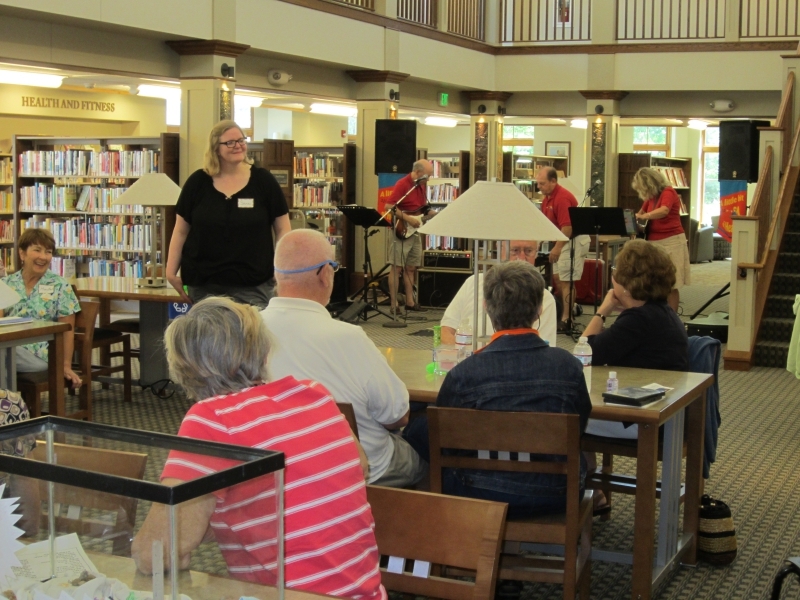 The Hartland Public Library was the place to be on August 6th 2016 for good tunes and ice cream socializing! 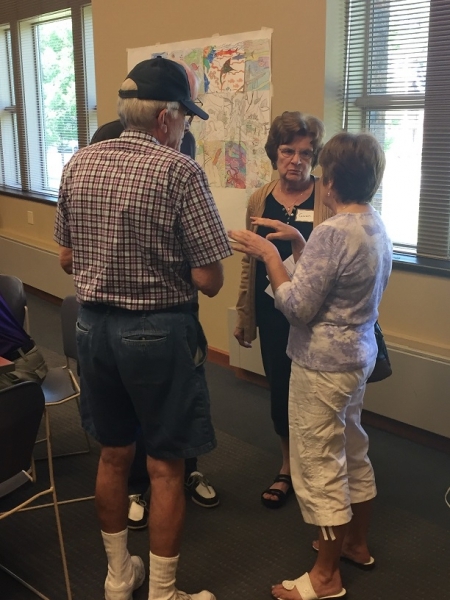 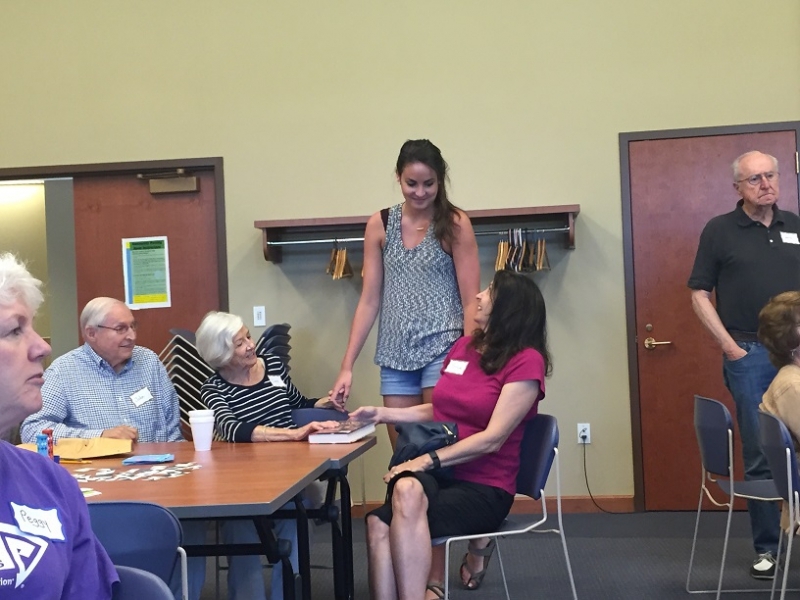 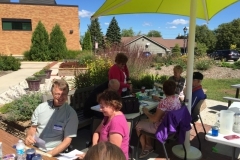 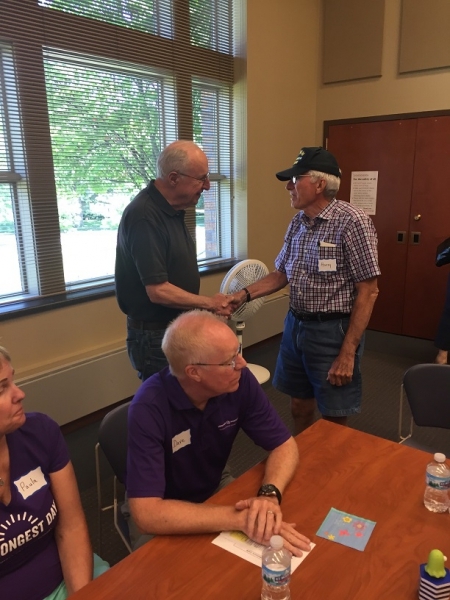 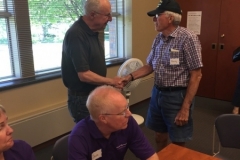 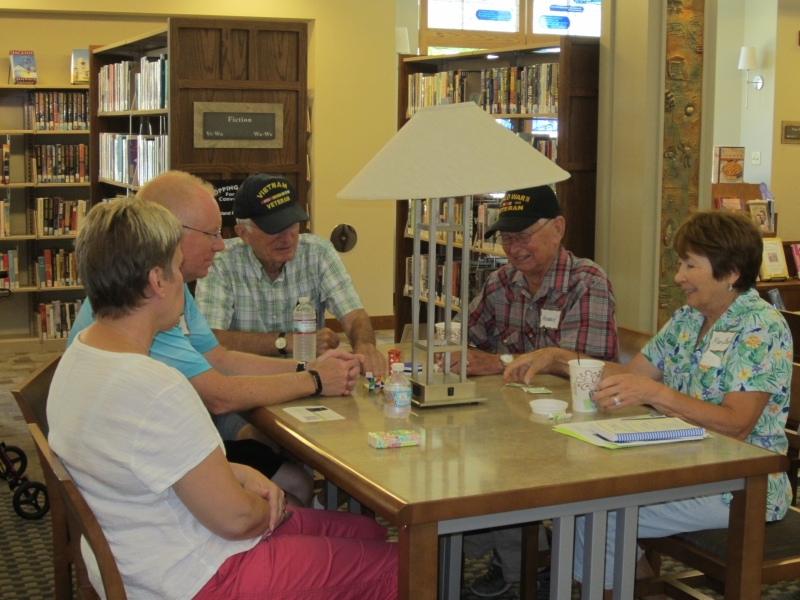 We had a great time at the July 1st 2016 Memory Cafe at the Hartland Library! 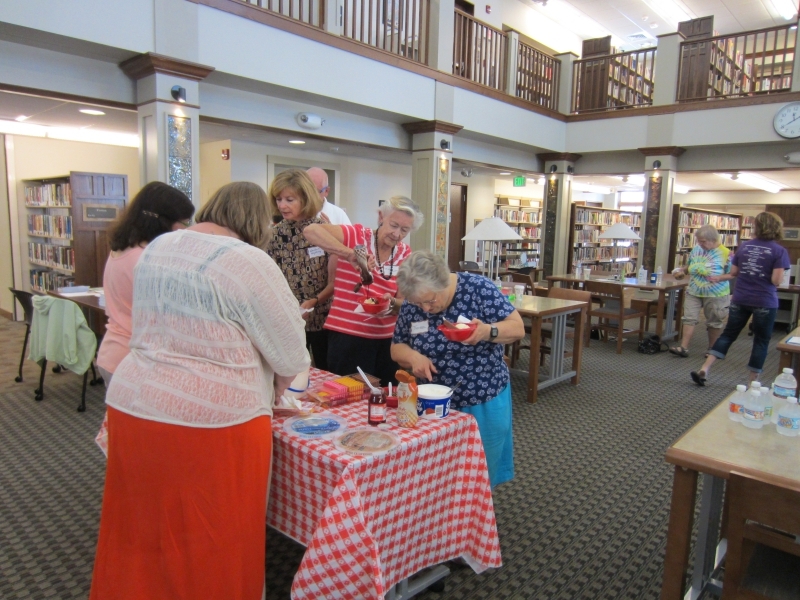 We sang many of our favorite patriotic songs, tested our knowledge of Independence Day and U.S history, and enjoyed cake and the company of old and new friends! 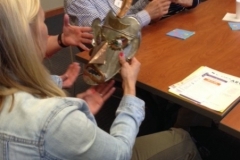 Poetry and masks together at last! 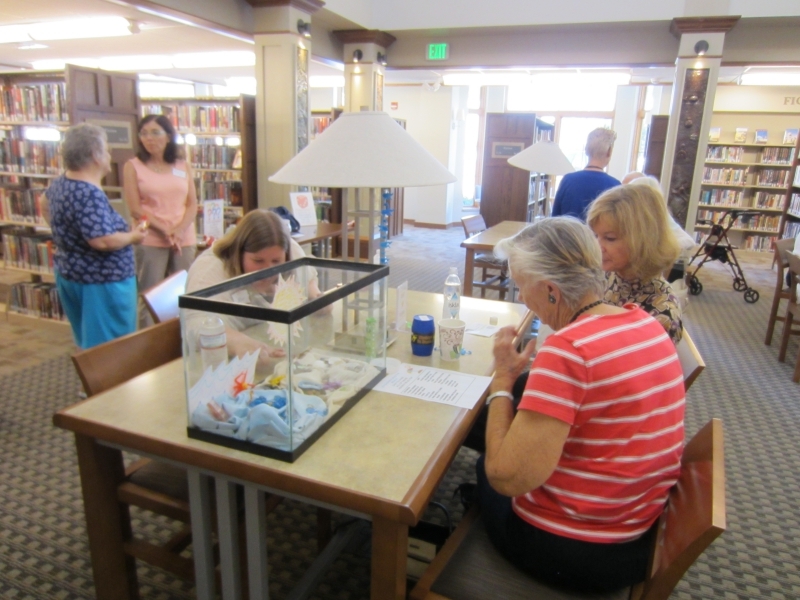 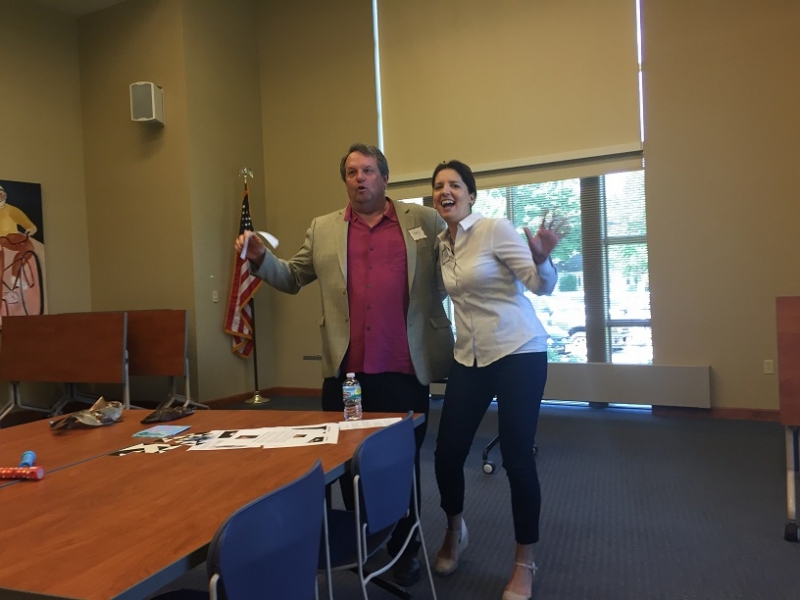 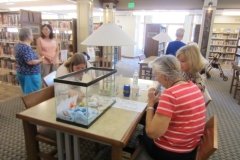 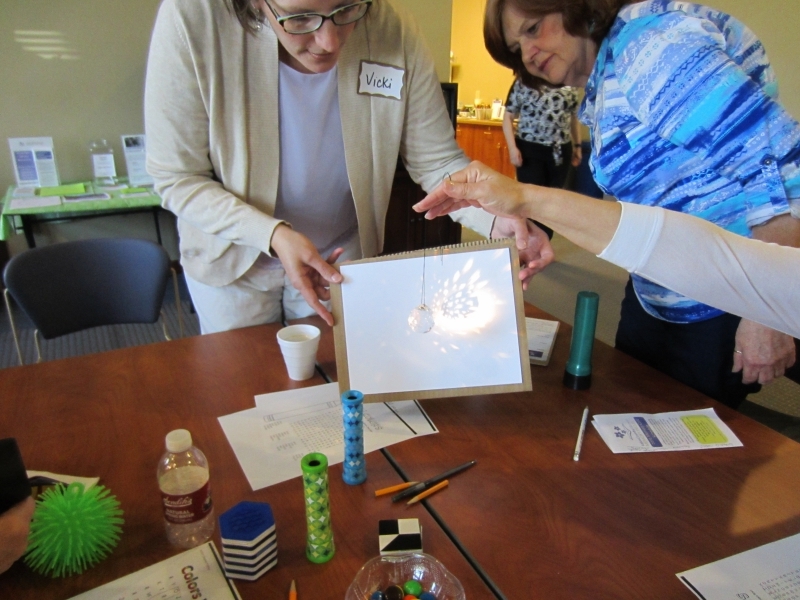 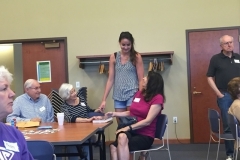 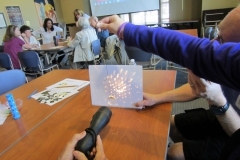 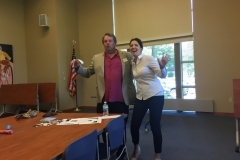 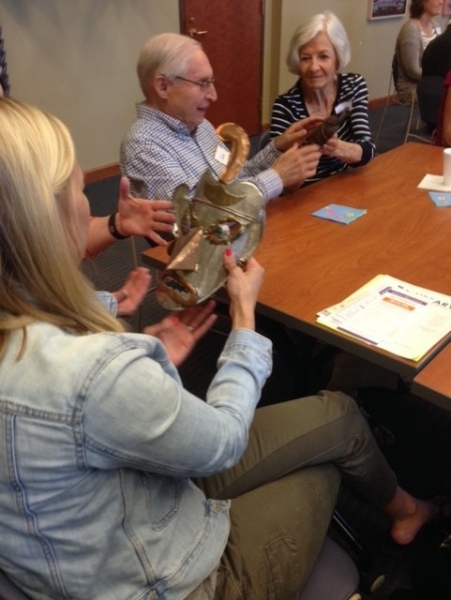 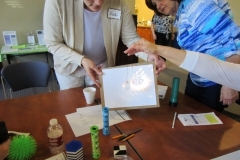 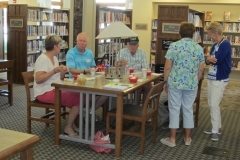 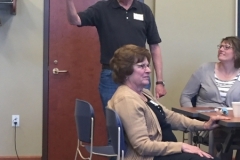 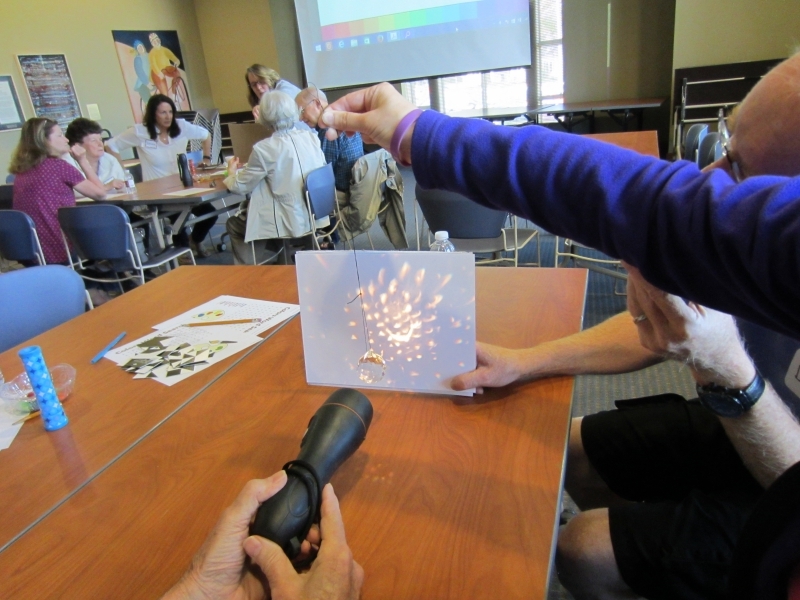 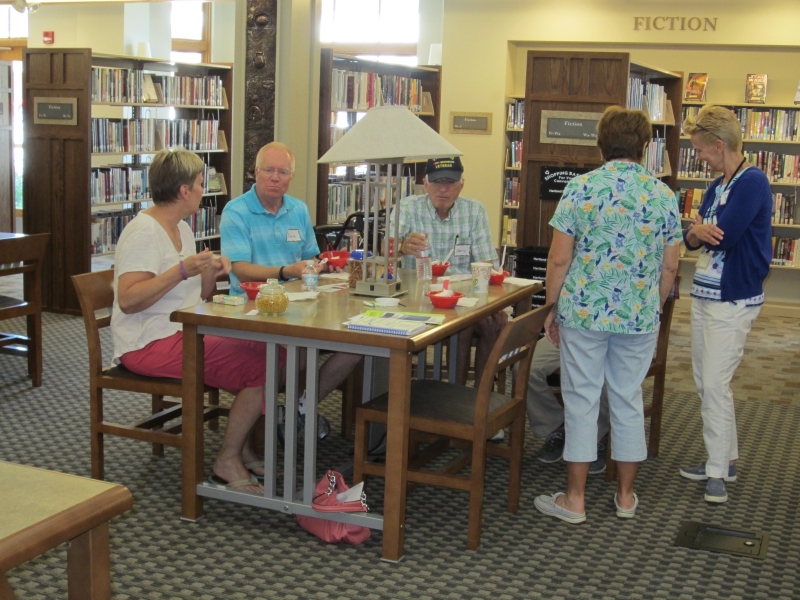 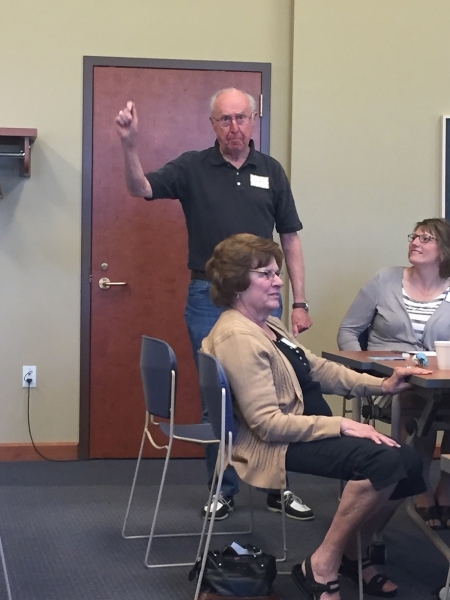 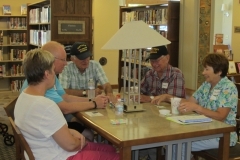 The June 6th 2016 Memory Cafe at the Pewaukee Public Library featured both with a very fun result! 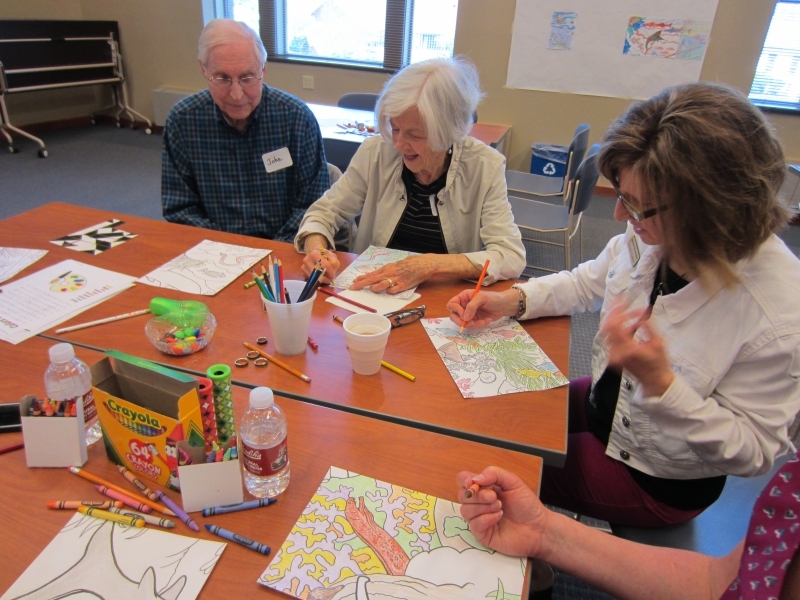 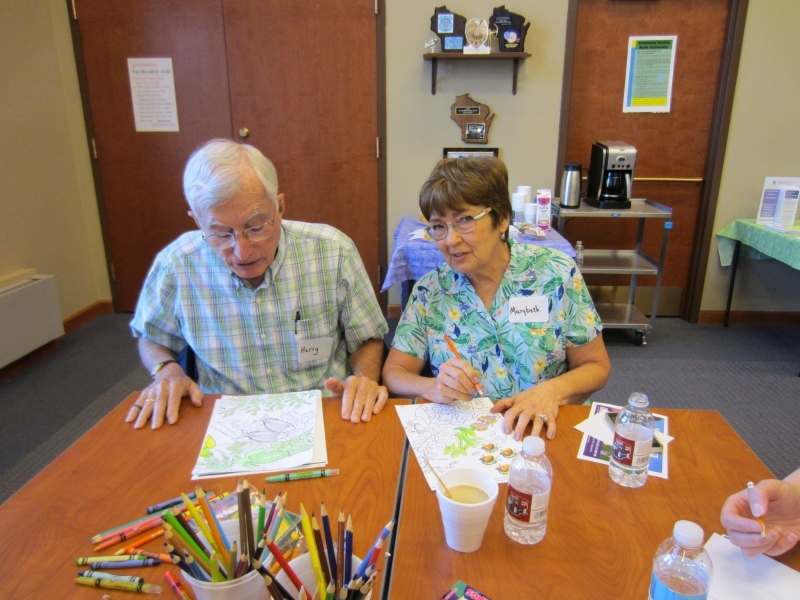 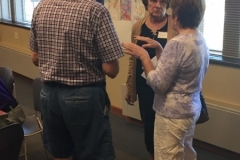 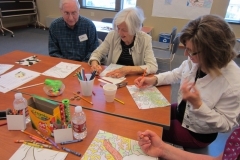 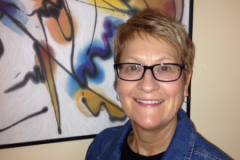 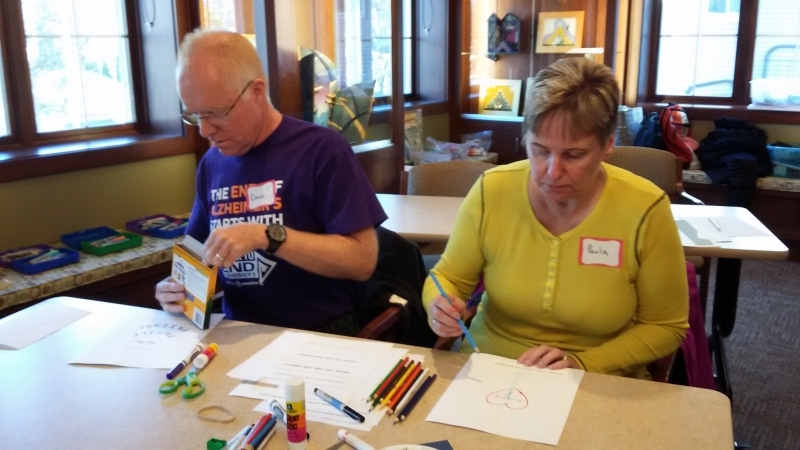 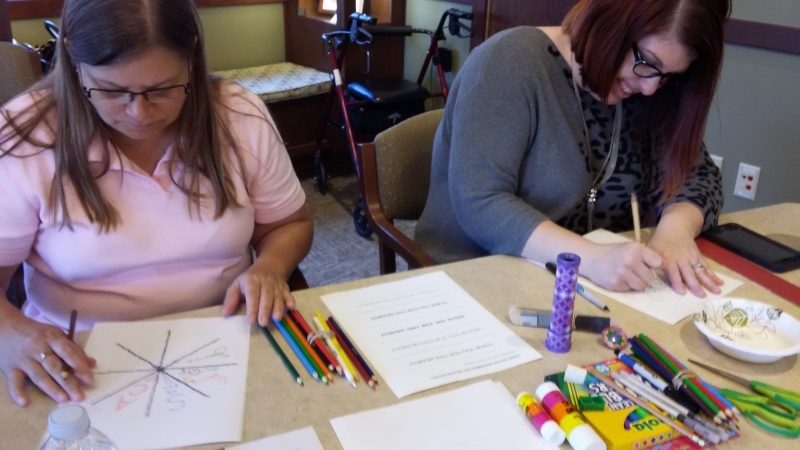 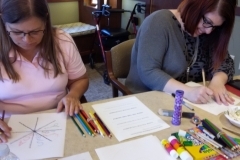 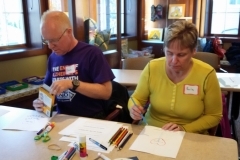 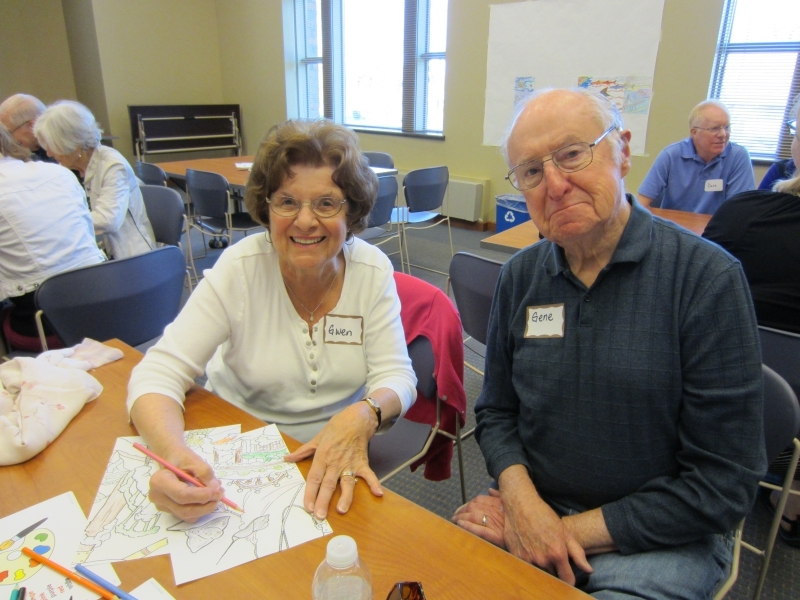 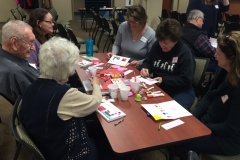 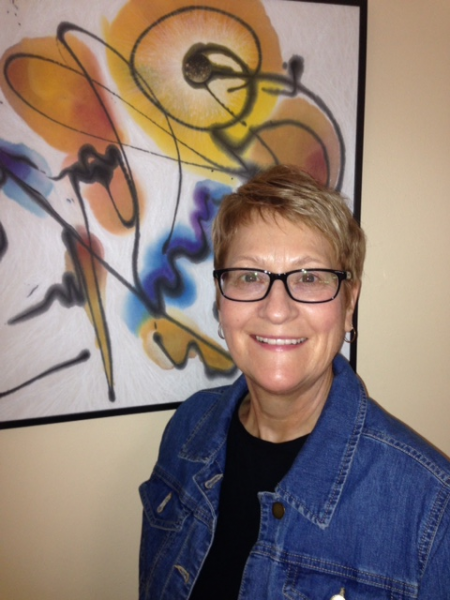 The May 3rd 2016 Memory Cafe at the Pewaukee Public Library was all about color. 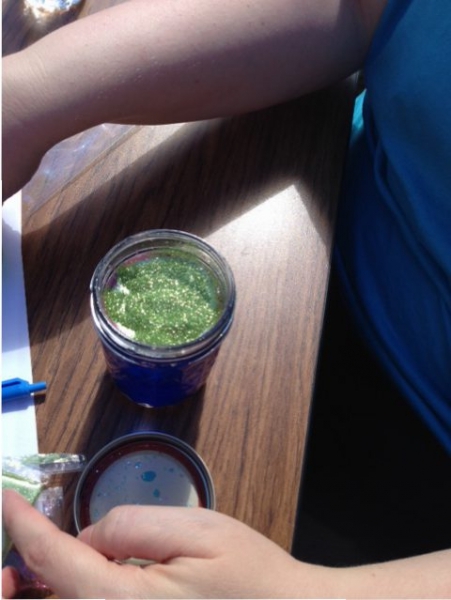 We made rainbows with prisms, found out our “true” feelings with mood rings, and created a coloring masterpiece! 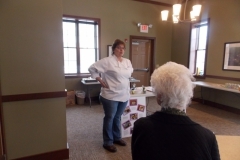 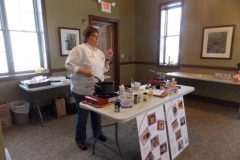 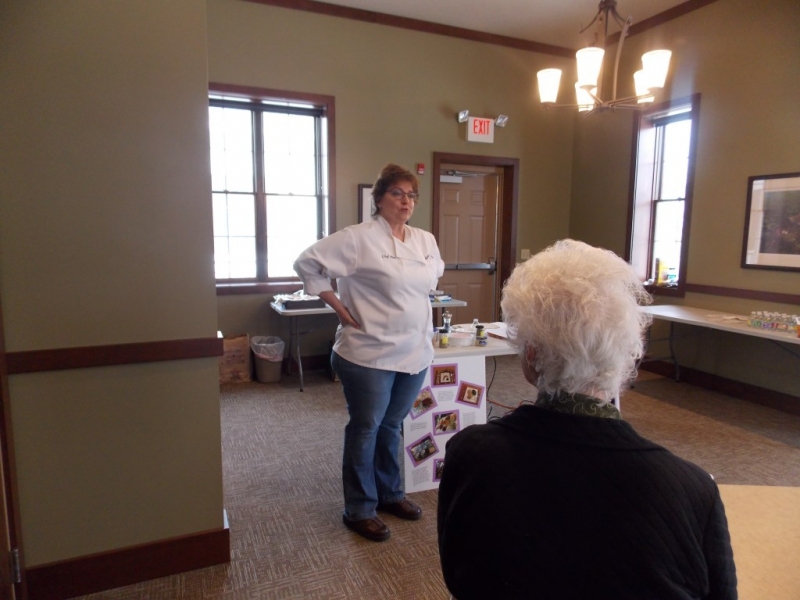 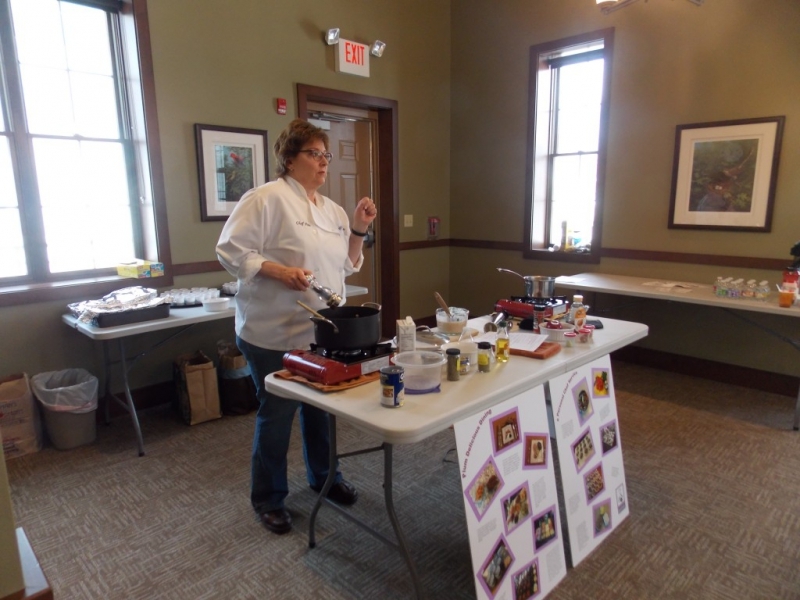 Chef Pam visited the Town Hall Library Memory Cafe on March 4th 2016 and showed us how to make healthy, simple recipes. 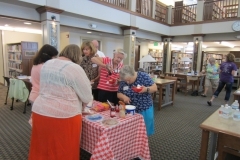 We sampled the recipes and enjoyed the company of all. 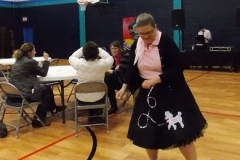 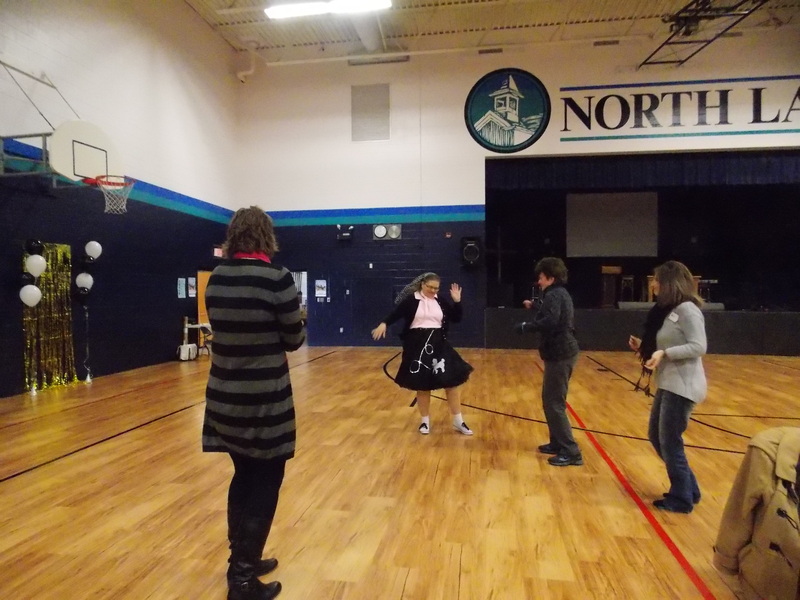 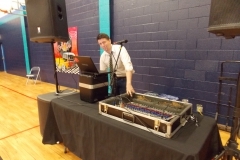 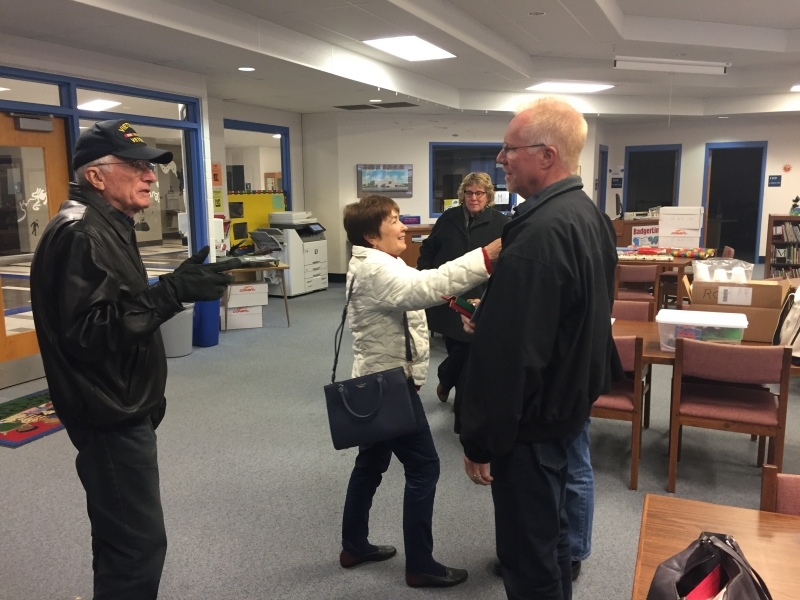 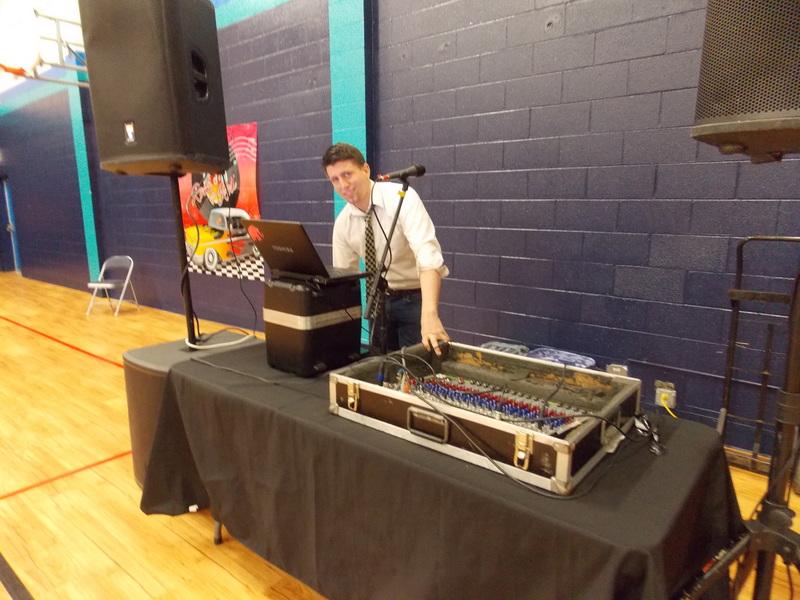 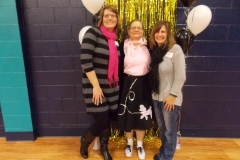 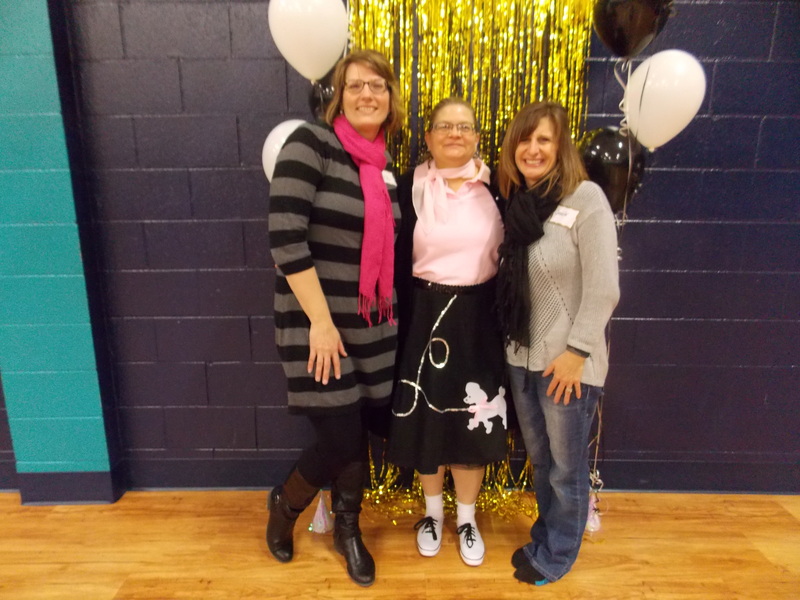 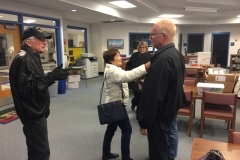 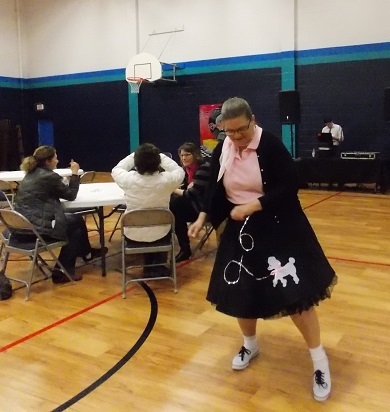 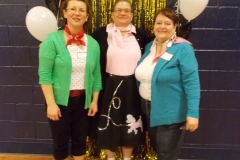 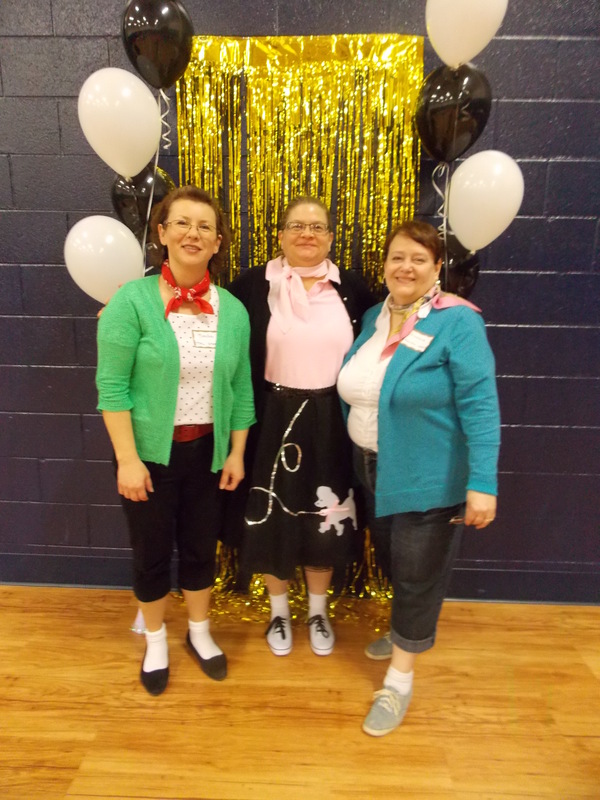 The Town Hall Library held its April 1st 2016 Memory Cafe at North Lake School, an old-fashioned ’50s Sock Hop, complete with a DJ spinning discs, photo op shoots, and treats! 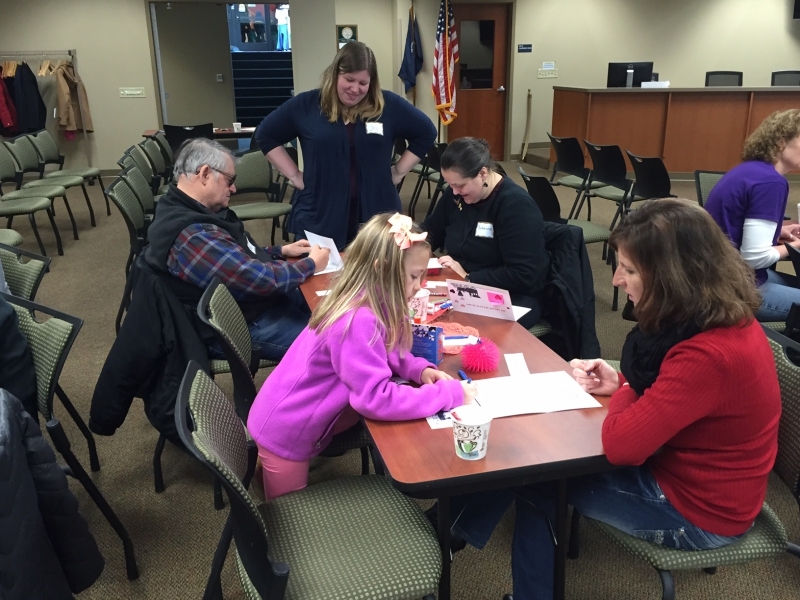 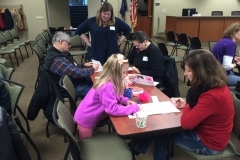 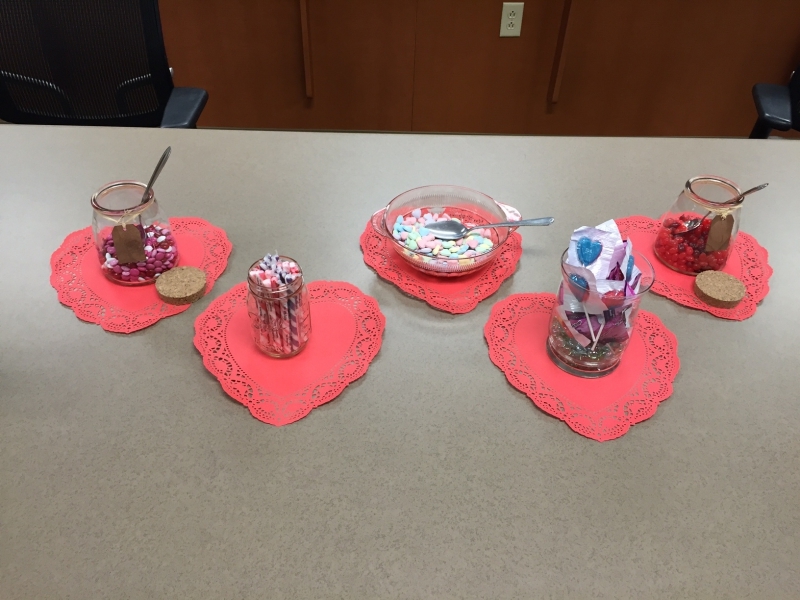 Valentine’s Day was celebrated a little early at the Delafield Public Library on February 5th 2016! 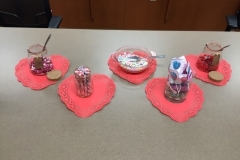 We indulged in sweet treats and created special memory valentines. 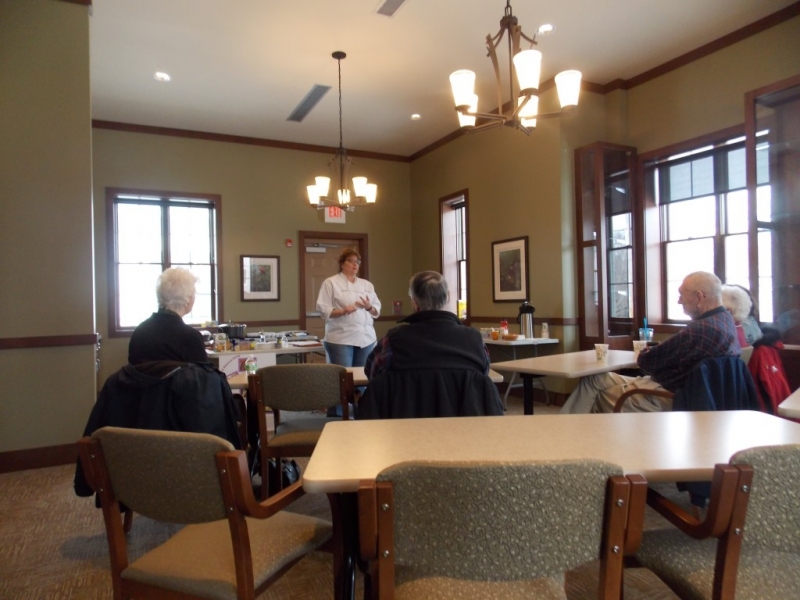 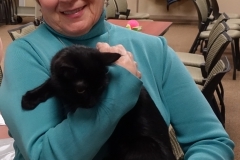 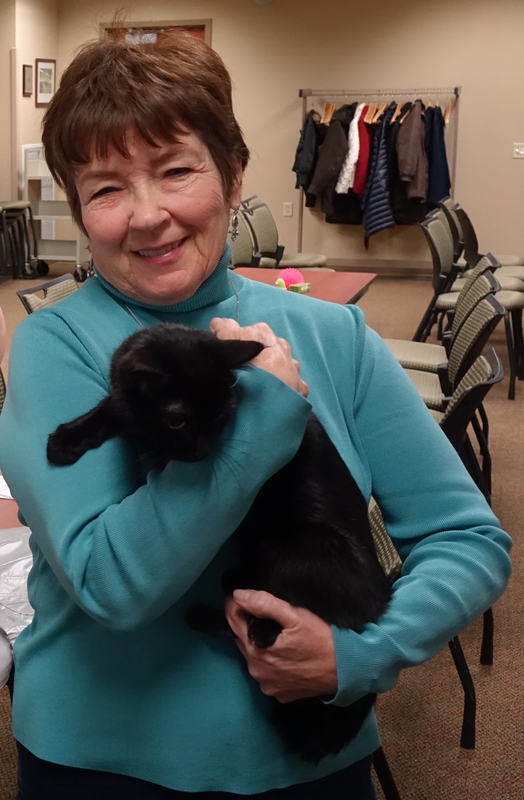 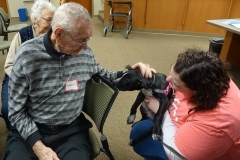 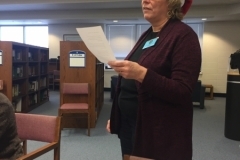 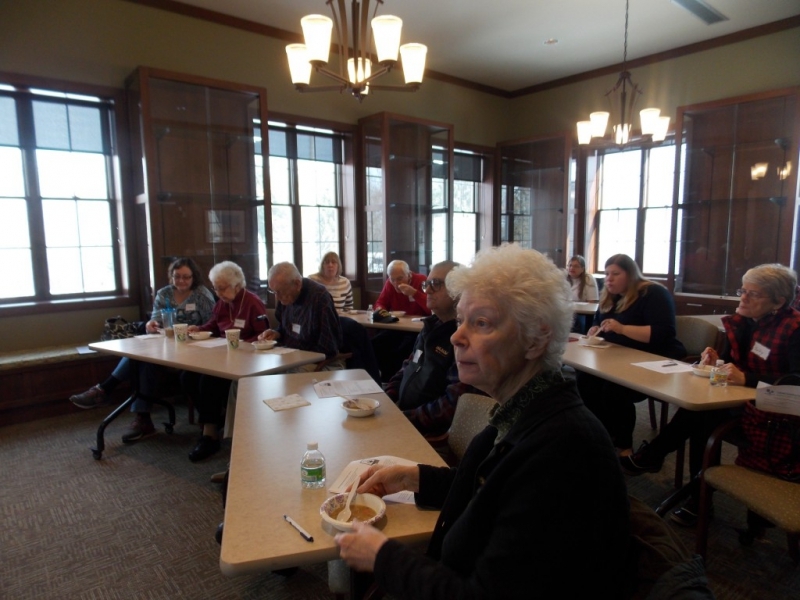 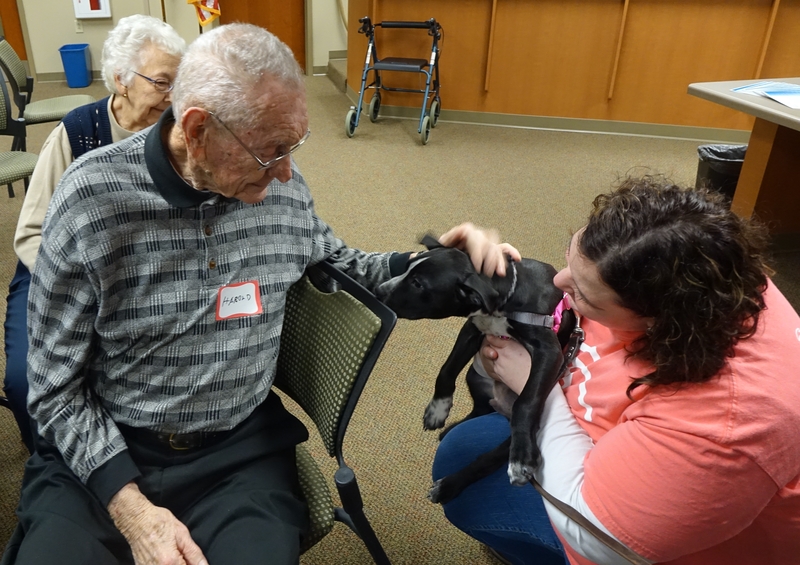 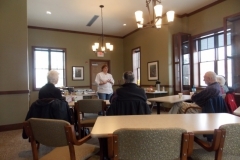 The Humane Animal Welfare Society visited the Delafield Public Library for the January 8th 2016 Memory Cafe, bringing some furry critters for participants to visit with. 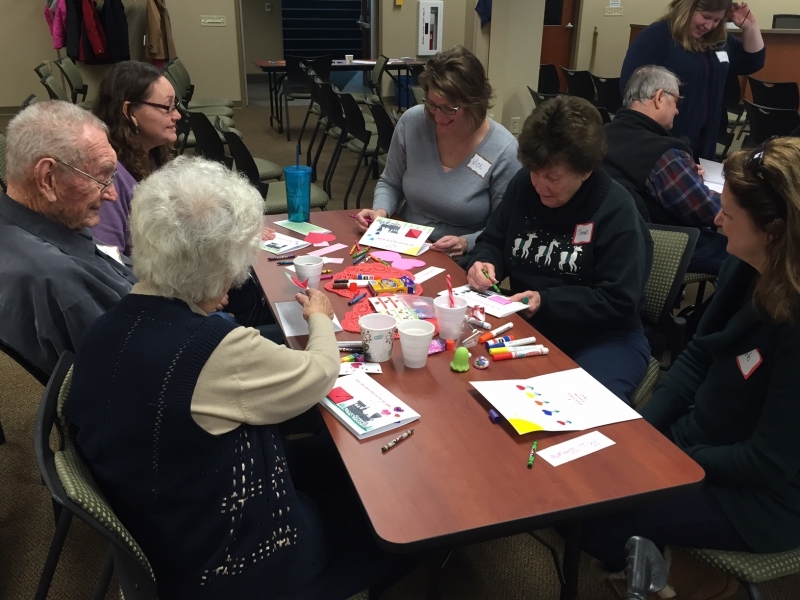 Click here to see photos from Memory Cafes held in 2017! 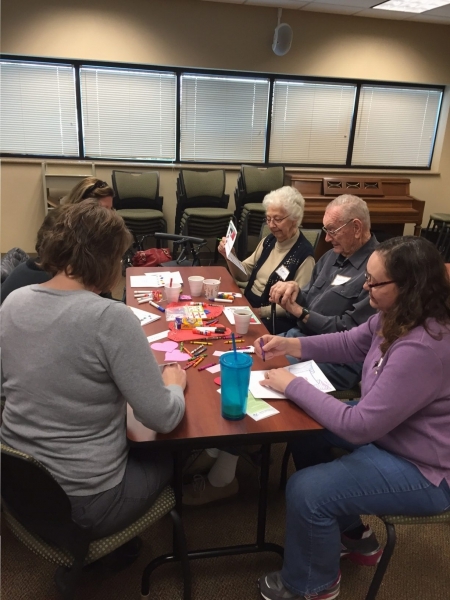 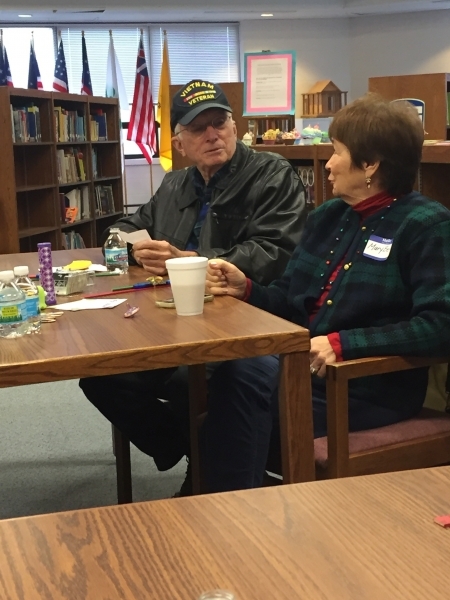 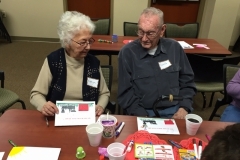 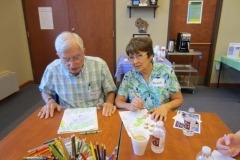 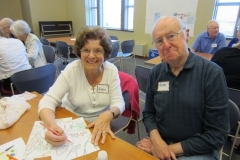 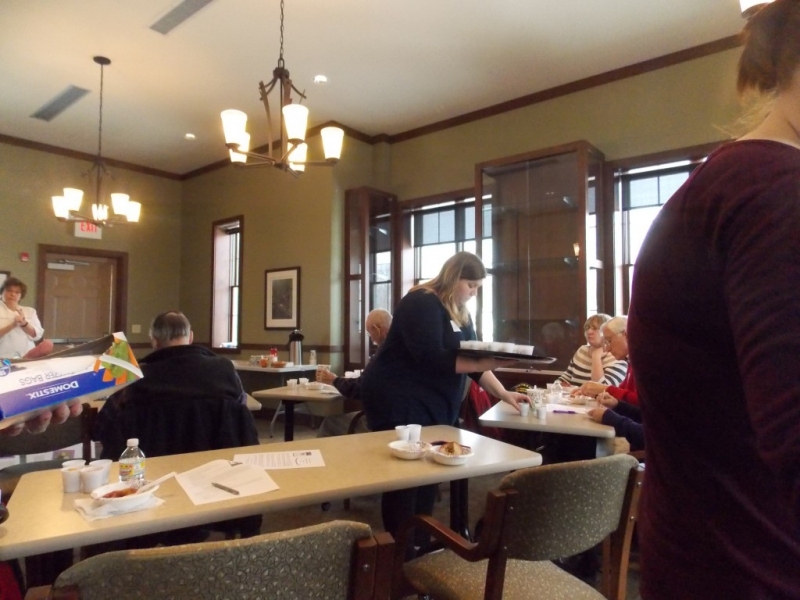 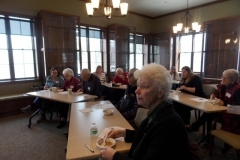 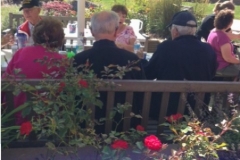 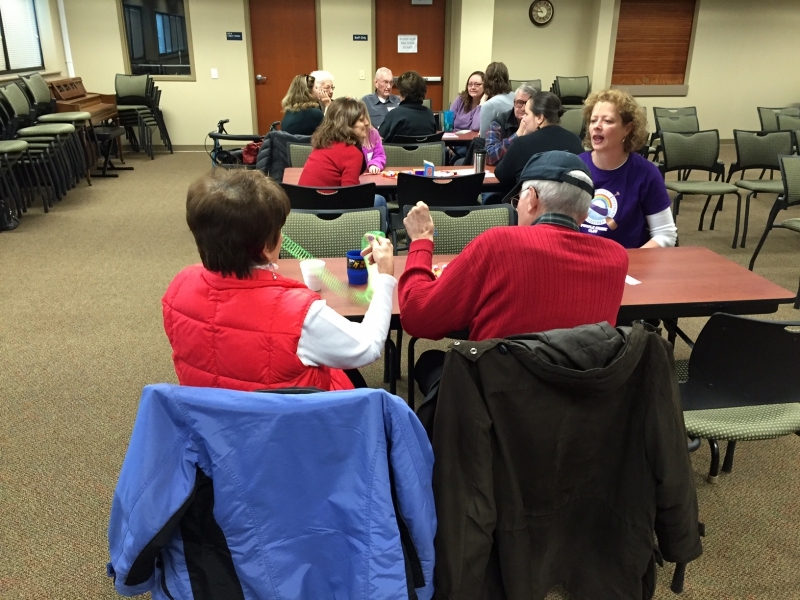 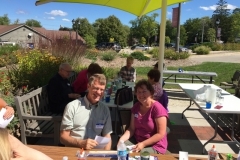 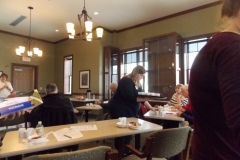 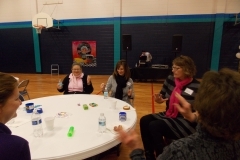 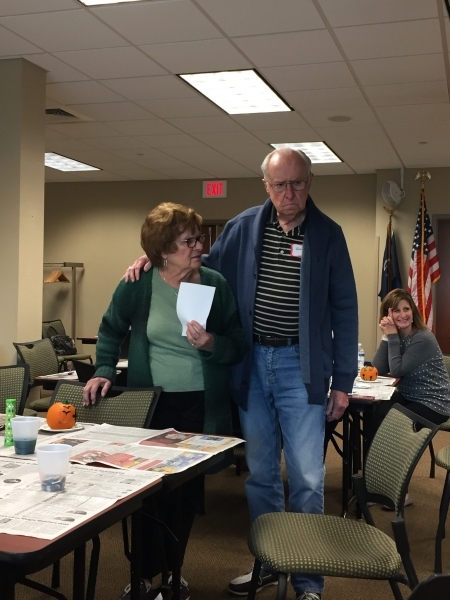 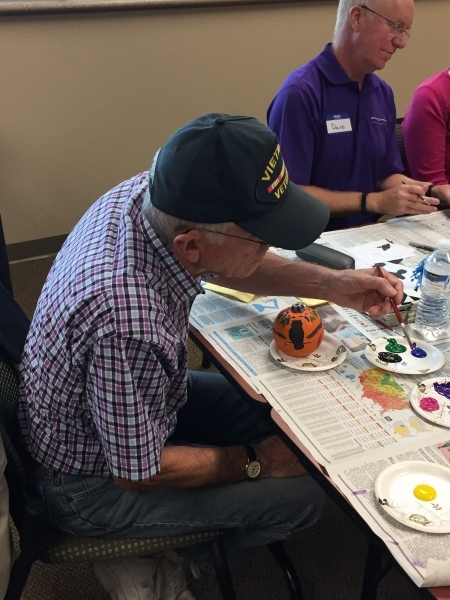 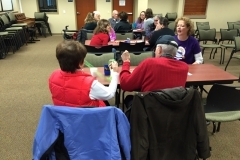 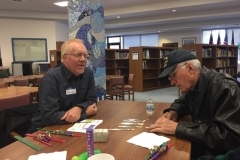 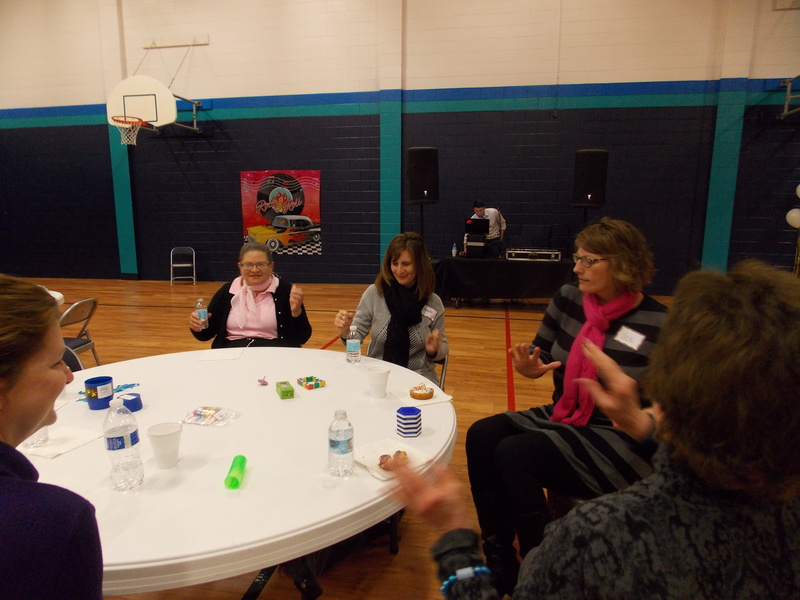 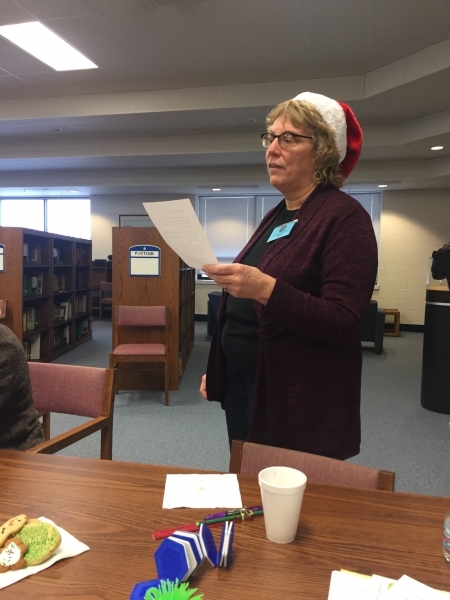 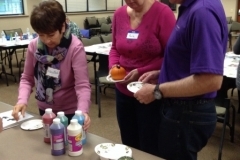 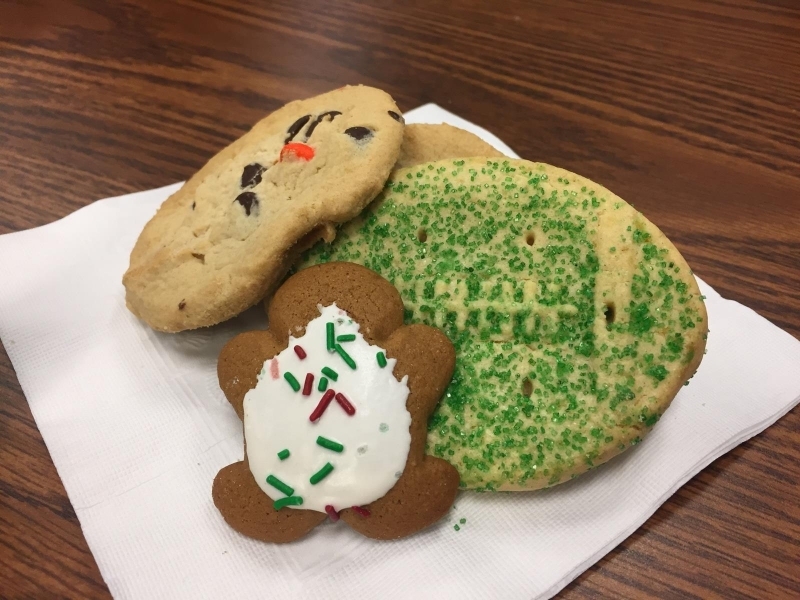 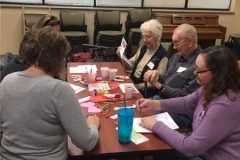 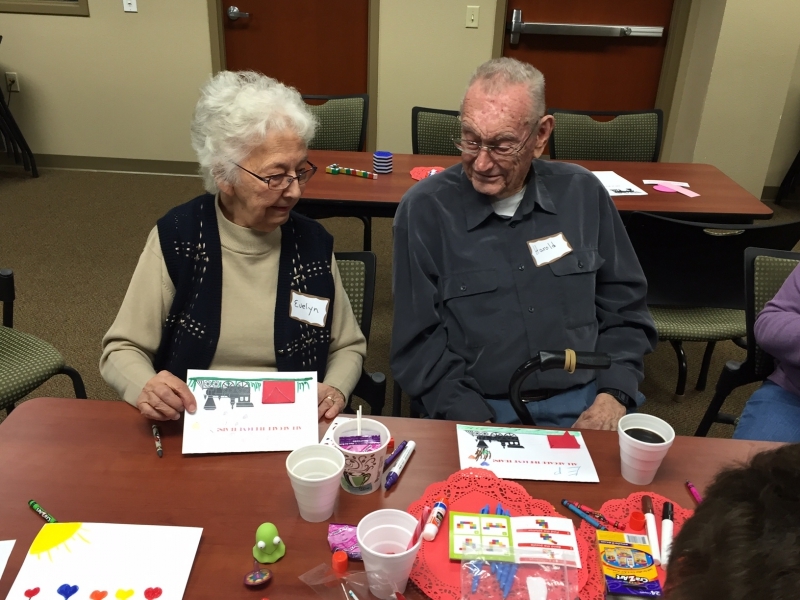 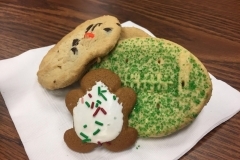 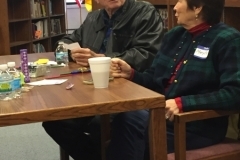 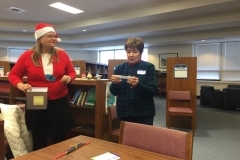 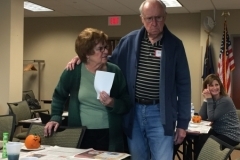 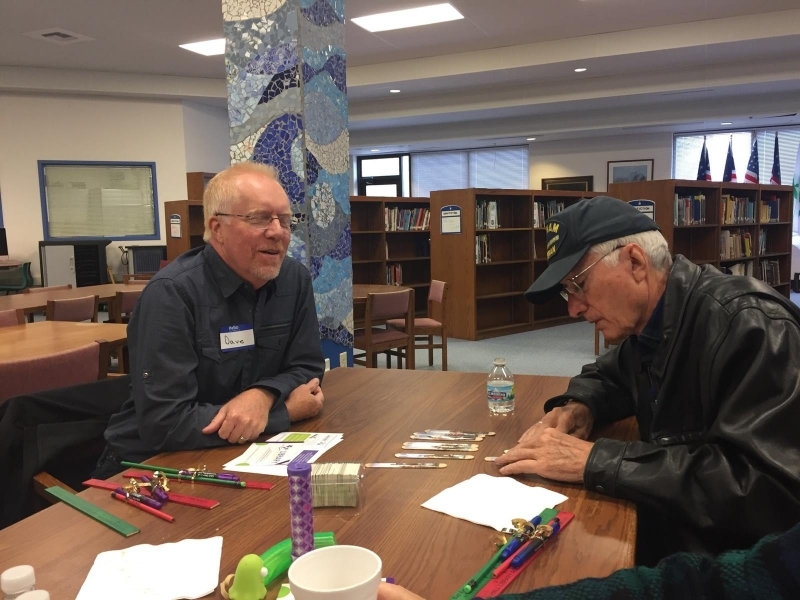 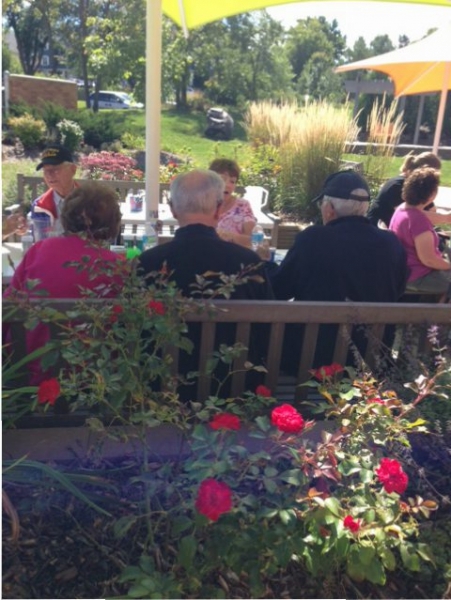 Click here to see photos from Memory Cafes held in 2015!